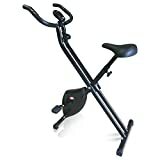 XS Sport Folding Exercise Bike with adjustable magnetic resistance – This space saving design is great as you can easily fold it upright after use (see images). This magnetic resistance machine gives you a great workout, with the ability to set the level of resistance to suit your level of fitness. This model now also comes with built in straps on the pedal, to hold you foot ion place (not pictured) and also comes with an adjustable deep padded extra foam seat.